Does Sony's new CSC hit the NEX level? Just as many thought the race to squeeze more pixels onto camera sensors had ended, Sony announced a new flagship model for its NEX line of mirrorless, interchangeable lens cameras in August 2011, with a 24.3Mp rear-illuminated CMOS sensor. 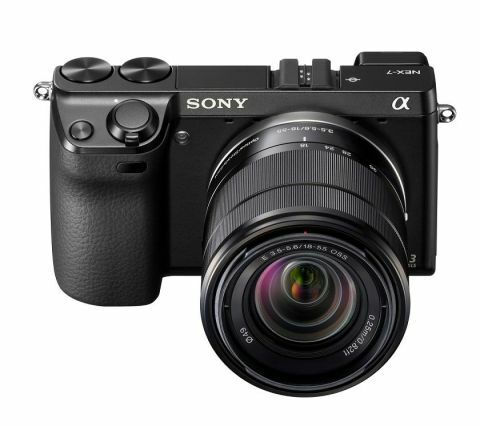 The Sony Alpha NEX-7 now sits right at the top of the company's compact system camera (CSC) range and is currently one of the most expensive CSCs available, costing around £1,000 for the body only, or around £1,130 with an 18-55mm f/3.5-5.6 kit lens. The NEX-7 appears to be aimed at demanding users who like the idea of a more compact camera, but don't wish to compromise on image quality or exposure control. Videographers may also look at this new Sony with interest because it's capable of recording Full HD movies with AF tracking and manual exposure control. Although the cameras in the NEX series are certainly smaller and lighter than equivalent SLRs, this camera couldn't really ever be classed as pocketable – unless you have very large pockets. The lightweight magnesium alloy body on it's own weighs a svelte 291g, but because the camera uses a relatively large APS-C-sized sensor, the lenses are on the large side. Using a large sensor has its benefits. The larger surface area allows larger photosites, which should improve the signal-to-noise ratio and the quality of images shot in low light. A growing selection of E-mount lenses are available for the NEX series, covering focal lengths from 16mm to 210mm. A range of primes optics, including a 16mm f/2.8 pancake, are also on offer, which are ideal for those wishing to travel a bit lighter. The NEX-7 lens mount differs from the A-mount found on Sony's Alpha range of SLR and SLT cameras, so an adapter is necessary to mount A lenses on a NEX body. This could be of interest to those who already own a collection of Sony or Minolta lenses, although only SSM or SAM lenses will autofocus using the adapter.